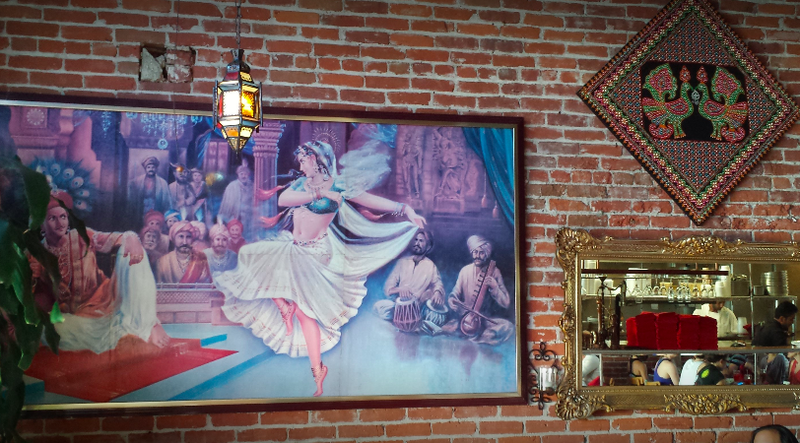 A local favorite and tradition, All India Cafe has been voted Best Indian Restaurant by San Gabriel Valley residents in Pasadena Weekly's annual 'Best Of' Awards for the last 15 years and counting. 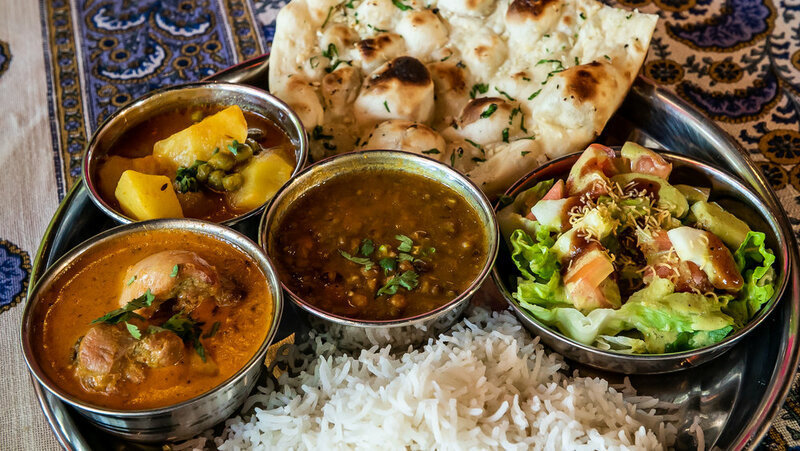 Discerning locals who affectionately refer to their favorite eatery as "All India" have been repeat customers for years because of the Khinda's impeccable service and authentic, consistently delicious cuisine. 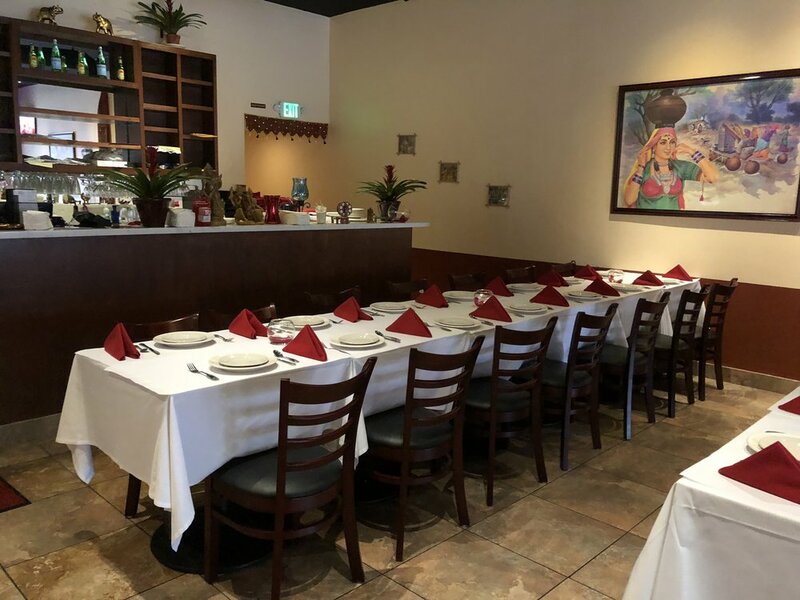 The award-winning menu primarily draws inspiration and tradition from Northern India while infusing a bit of Southern India's flavor & flare. Everything is made fresh in the restaurant -- the food is nutritious and comforting without being too heavy, and there are many gluten-free & vegan options. 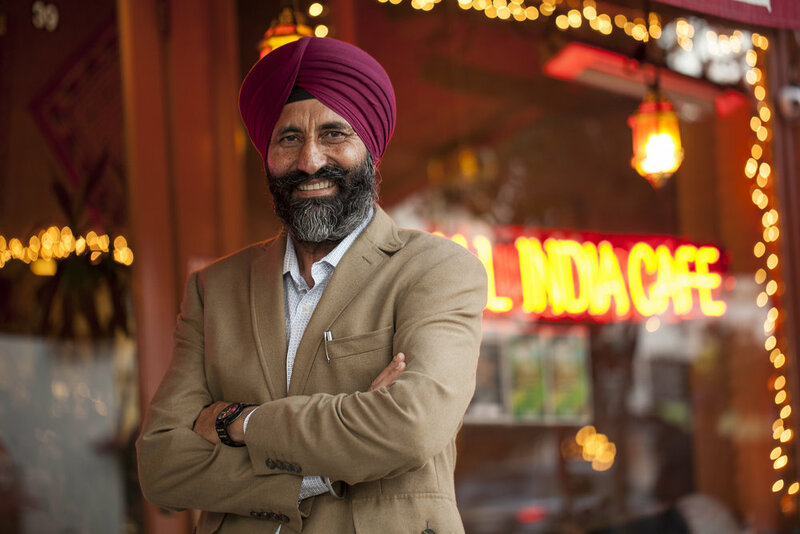 Husband and wife Santokh Singh Khinda and Parminder K. Khinda opened All India Cafe in 1996 to create an inviting Indian dining experience that is healthy, fresh, & that shows their genuine dedication to each and every guest. Crisp homemade wafers topped with onions, potatoes, assortments of chutneys, chickpea crisp noodles, garnished with cilantro. A medley of puffed rice, potatoes, onions, wafers and chickpea crisp noodles, garnished with cilantro, three chutneys and lime juice. Crisp balls stuffed with chickpeas, potatoes, onions, homemade yogurt and three chutneys. Indian potato pancakes, topped with chopped onions, tamarind and mint chutney. The most popular snack throughout India. Vegetarian turnover stuffed with potatoes, peas, spices, herbs, and served with tamarind chutney. Three freshly made chutneys served with homemade wheat flour chips. A popular griddlecake from Mumbai made from cream of wheat, tomatoes, onions, green chilies, cilantro, and served with coconut chutney & sambar. A South Indian crispy crepe made with rice and lentil flour, filled with spiced potatoes and served with sambar & coconut chutney. Most popular Indian snack served with homemade sweet tomato chutney. Onion fritters seasoned with ginger, spices, and served with homemade sweet tomato chutney. Spinach, cauliflower, and potato fritters served with homemade sweet tomato chutney. Marinated all white chicken fritters served with homemade sweet tomato chutney. Marinated Black Tiger Shrimp tossed with puffed rice, potatoes, wafers, and chickpea crisp noodles with three chutneys, cilantro, and lime juice. Fish marinated with ginger, green chili and cilantro, served with homemade sweet tomato chutney. Crispy Black Tiger Shrimp marinated with ginger, green chili and cilantro cooked with wheat of rice, served with homemade sweet tomato chutney. South Indian steamed cake made with rice and lentil flour, served with sambar and coconut chutney. Chicken wings marinated with masala spices and barbecued in the clay oven. Chicken soup prepared with Basmati rice, spinach leaves, tomatoes, flavored with onions, ginger, garlic, & spices, garnished with cilantro. Fresh vegetable soup prepared with spices & fresh basil. South Indian lentil soup prepared with onions, tomatoes, & seasoned with spices and cilantro. Fresh Romaine lettuce with cucumbers and tomatoes, tossed in our homemade dressing. Sautéed Japanese eggplant topped with seasoned tomato sauce & ginger garlic yogurt, and cilantro. Tandoori mushrooms, paneer & eggplant served on a bed of romaine lettuce, cucumber, & tomatoes, tossed in our homemade dressing. Tandoori chicken, mushrooms & paneer on a bed of Romaine lettuce, tomatoes, & cucumber tossed in our homemade dressing. Marinated fish with mushrooms and paneer on a bed of Romaine lettuce, tomatoes, & cucumber tossed in our homemade dressing. Marinated Black Tiger Shrimp with mushrooms and paneer on a bed of Romaine lettuce, tomatoes, & cucumber tossed in our homemade dressing. Half-chicken marinated overnight in a sauce made from homemade yogurt, fresh herbs & spices. Boneless pieces of chicken marinated in homemade sauce with cilantro, ginger, garlic & spices. Lean ground lamb marinated in minced onions, green chilies & spices cooked on a skewer. Mildly marinated very tender boneless pieces of lamb. Mildly marinated fresh fish of the day served with tomatoes & onions. Mildly marinated black tiger shrimp cooked in an Indian clay oven. An assortment of chicken tikka, tandoori chicken, sheesh kebab & boti kebab served with naan. Boneless chicken marinated in mint & basil. Chef’s selection of the day, prepared in a variety of ways. Tandoori cooked chicken served in a cream sauce made with onions, ginger & fenugreek leaves. Tandoori cooked lamb served in a cream sauce made with onions, ginger, garlic & fenugreek leaves. Tandoori cooked fresh fish of the day, served in savory sauce made with onions, ginger, garlic & fenugreek leaves. A favorite of Bombay. Chicken bhuna cooked with fresh herbs and spices, stuffed in homemade egg-washed tortilla with two chutneys & marinated onions. Served with raita. A favorite of Bombay. Lamb bhuna cooked with fresh herbs and spices, stuffed in homemade egg-washed tortilla with two chutneys & marinated onions. Served with raita. Cauliflower & potatoes sautéed with tomato, ginger, green chili & spices, stuffed in a homemade egg-washed tortilla with two chutneys & marinated fresh onions. Served with raita. Your choice of any two vegetables with basmati rice, dal of the day, naan & kachumber or raita. Your choice of chicken or lamb curry with aloo matter, basmati rice, dal of the day, naan & kachumber or raita. Your Choice of chicken tikka or tandoori chicken with aloo matter, basmati rice of the day, dal of the day, naan & kachumber or raita. Chicken Tikka Masala with aloo matter, basmati rice, dal of the day, naan & kachumber or raita. 2 Samosas, choice of three vegetarian dishes, basmati rice, naan, raita, and choice of dessert to share. 2 Samosas, tandoori chicken, choice of two vegetarian dishes, basmati rice, naan, raita, and choice of dessert to share. 2 Samosas, chicken tikka & chicken tikka masala, choice of two vegetarian dishes, rice, naan, raita, and a dessert to share. Boneless pieces of chicken prepared in a traditional sauce made from tomatoes, onions, ginger, garlic & freshly ground spices. Tandoori cooked chicken with coconut milk in Indian Masala sauce. Marinated Tandoori cooked served in a tomato saffron sauce. Served in a light cream sauce made with onions, ginger, garlic, fenugreek leaves, & tomato sauce. Boneless pieces of chicken prepared in a spicy sauce made from tomatoes, potatoes, onions, ginger, garlic, & lime juice. Chicken cooked with chunks of mango, onions, ginger, garlic, in an herb savory curry sauce. Boneless chicken & spinach sautéed with onions, ginger & garlic. Boneless pieces of lamb prepared in a traditional sauce made from tomatoes, onions, ginger, garlic & freshly ground spices. Served in a light cream sauce made with onions, ginger, fenugreek leaves, & tomato sauce. Boneless pieces of lamb prepared in a spicy sauce made from tomatoes, potatoes, onion, ginger, garlic, & lime juice. Boneless lamb & spinach sautéed with onions, ginger & garlic. Marinated Tandoori lamb cooked in a tomato saffron sauce. Fresh fish or black tiger shrimp prepared with onions, ginger, tomato & lime juice. Black Tiger shrimp & spinach sautéed with onions, ginger & garlic. Prepared with an assortment of mix vegetables in a very savory yellow curry sauce with a touch of coconut milk. Chef's choice of the day. Carrots, cauliflower, potatoes, & green peas sautéed with onions & ginger. A puree of tandoor baked eggplants sautéed with onions, fresh tomatoes, ginger, & green chilies. Cauliflower & potatoes sautéed with tomatoes, ginger, green chili, ground coriander, turmeric & cumin seeds. Potatoes & green peas in homemade sauce with tomatoes, ginger, green chilies & herbs. Pureed spinach leaves & bite-sized potatoes, sautéed with onions, ginger, green chilies, & spices. Indian chickpeas prepared in the Punjabi style with onions, ginger and tomatoes. Chef's selection of Dal (Indian lentils) of the day. Delicious combination of several fresh vegetables and nuts in a creamy sauce. Tofu cooked with onions, ginger, & garlic in a coconut milk. Pureed spinach leaves & paneer cubes or tofu, sautéed with onions, ginger, & green chilies. Sautéed paneer (homemade Indian cheese) & mushrooms cooked in a fresh tomato & saffron sauce. A popular dish in Punjab. Paneer cooked with fresh tomatoes, ginger, & garlic in a creamy suace. Fresh vegatables & paneer balls with raisins and nuts, cooked in fresh tomatoes, onion, ginger, garlic, & fenugreek leaves with a touch of cream. Classic leavened bread made with white flour and baked in the tandoor. Naan topped with chopped garlic & cilantro, baked in the tandoor. Naan stuffed with finely chopped onion & baked in the tandoor. Naan stuffed with homemade cheese and cilantro baked in the tandoor & served with fruit chutney. Naan stuffed with minced lean lamb, finely chopped onion & cilantro, baked in the tandoor & served with fruit chutney. Naan stuffed with tandoor cooked marinated chicken & served with fruit chutney. Naan stuffed with spiced mashed potatoes, cooked in the tandoor & served with fruit chutney. Whole wheat unleavened bread filled with spiced mashed potatoes, cooked in the tandoor & served with fruit chutney. Multi-layered whole wheat bread baked in the tandoor. Whole wheat unleavened bread cooked in the tandoor. Whole wheat unleavened bread cooked on a iron griddle & finished on an open flame. Grown in the foothills of Himalayas. To maintain its natural aroma and flavor we serve it simply steamed. Basmati rice prepared with chef’s selection of fresh vegetables and saffron. To maintain its natural aroma & flavor, we serve it simply steamed. Biryanis are cooked with Basmati rice, nuts & raisins, in a Punjabi style served with Raita. Curried mixed vegetables cooked with rice. Curried chicken cooked with rice. Curried lamb cooked with rice. Curried black tiger shrimp cooked with rice. Chopped cucumber, red onions, fresh tomatoes & cilantro with a splash of lime juice. Homemade yogurt with grated cucumber, onions, & carrots. 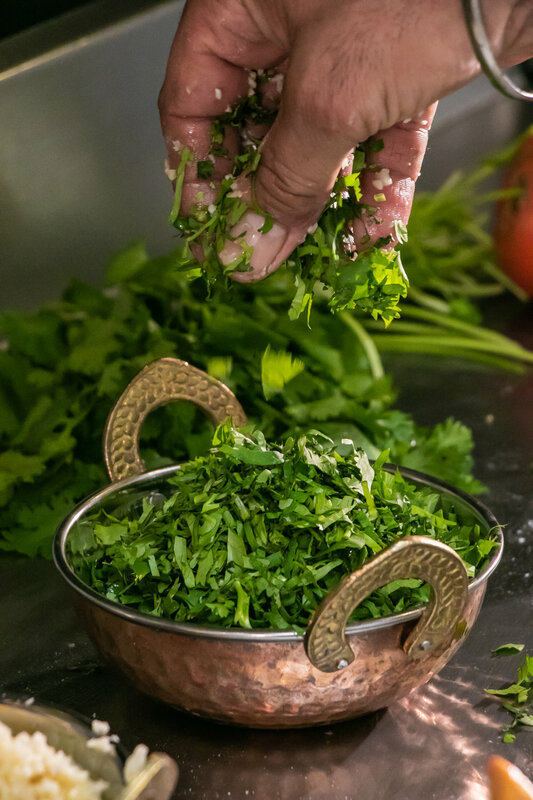 Your choice of one chutney from a variety of fresh homemade Indian dips. A variety of Indian pickled fruits & vegetables. Crackers made from stone ground lentils, flavored with spices & baked in tandoor, served with chutney. Spiced Indian style fries with a drizzle of masala sauce, served with chutneys. Chicken curry served with dal of the day, basmati rice, naan & salad. Lamb curry served with dal of the day, basmati rice, naan & salad. Tandoori chicken served with aloo matter, dal of the day, basmati rice of the day, naan & salad. Chicken Tikka Lunch served with aloo matter, dal of the day, basmati rice of the day, naan & salad. Chicken tikka masala served with aloo matter, dal of the day, basmati rice , naan & salad. Lamb masala served with aloo matter, dal of the day, basmati rice, naan & salad. Choice of one: Boti Kebab or Sheesh Kebab. Served with aloo matter, dal of the day, basmati rice of the day, naan & salad. Choice of one: Chicken, Lamb, Gobi Aloo Frankie, served with salad and raita. Curried mixed vegetable cooked with basmati rice nuts, and raisins. Served with raita. Curried chicken cooked with basmati rice in a Punjabi style with nuts and raisins. Served with raita. Curried lamb cooked with basmati rice in Punjabi style with nuts and raisins. Served with raita. Choice of one: Gobi Aloo, Palak Aloo, Baingan Bharta, Aloo Mattar, Kabuli Cholay, Mixed Vegetable. Served with dal of the day, basmati rice, naan and salad or raita. Choice of one: Shahi Paneer, Makhni Paneer, Palak Paneer, Palak Tofu, Tofu Masala, Malai Kofta. Served with dal of the day, basmati rice, naan and salad or raita. Marinated tandoor cooked chicken with mushrooms and paneer on a bed of a romaine lettuce, cucumbers and tomatoes, tossed in our homemade dressing and served with naan. Marinated tandoor cooked black tiger shrimp or fish of the day, with mushrooms, paneer, on a bed of romaine lettuce, cucumbers & tomatoes, tossed in our homemade dressing, served with garlic naan. Tandoori mushrooms, paneer & Japanese eggplant on a bed of romaine lettuce, cucumbers & tomatoes tossed in our homemade dressing served naan. Fresh fish or black tiger shrimp served with aloo matter, rice of the day, naan & salad. Black tiger shrimp served with aloo matter, rice of the day, naan & salad. Homemade lemonade, made Indian style with fresh ginger and fresh lime juice. Homemade yogurt and mango shake. Homemade yogurt & rose water. Mildly spiced, salty drink made from homemade yogurt. Indian hot tea with milk and spices. Mint flavored Indian tea served with sweet milk. Honey sweetened Jamaican style ginger beer. Indian rice pudding made in the traditional way with flavor of green cardamom. Carrot pudding made with carrots, golden raisins, and almonds. Milk-balls served in rose flavored syrup. Three mouth-watering flavors of homemade Indian ice cream: mango, ginger, or pistachio. Pistachio & cardamom flavored homemade milk ball served in sweet syrup. The Best Catering in Glendale! @CheatDayInLA Visits All India Cafe in Glendale! Mouthwateringly fresh dishes... always made with the highest quality ingredients and in our kitchen with love. We cater all sizes and types of events — recent corporate catering clients include University of Southern California, The Alex Theatre, LegalZoom, The Age of Learning, and many more. We love to cater family gatherings as well - what is better than enjoying your favorite comfort food with the ones you love?! Spend $150 and receive $20 off your first catering order!